Back in 2012, I decided I wanted to see what books everyone else was reading and loving. I set up a personal book challenge called Challenge Me, where I asked everyone for recommendations of books they thought I would love. This list was then passed onto Liz De Jager, for her to pick out the final twelve books for my challenge. She picked some amazing books and I really enjoyed the challenge but life got in the way and I never finished it. So I've decided to resurrect the challenge. I have given it a new name! 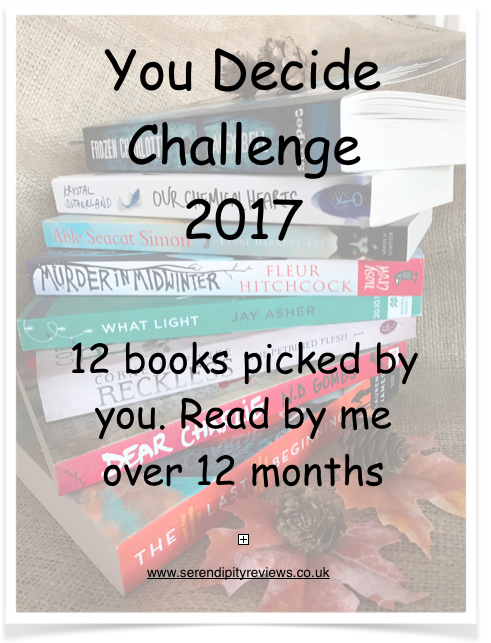 It will now be known as the You Decide Challenge, because basically you get to pick what I read. So now I will hand the baton over to you. I want you to either tweet me or write in the comments all the books you think I should read. It can be any genre and for any age group. I don't even mind if you pick non fiction. All I ask is that they aren't huge 500 pagers, as I only have a month to read them and do have review books to get through too. Once I have a long list, I will put it up on the blog for everyone to see and highlight the books that I have already read. Then I will pick twelve or if I have a willing volunteer, I will get them to pick them for me. So let your recommendations hit me! The Safest Lie by Angela Cerrito. Heartwarming and lyrical.